This letter and next week’s will be two of the most important I’ve ever written. They will set out my philosophy about how we have to invest in the coming days and years. They are the result of my years of actually working with clients and money managers and thinking about the economic and particularly the macroeconomic world. Because of some of the developments I will be discussing, I think the future is likely to be extremely challenging for traditional portfolio allocation models. The letters also discuss my thinking on new developments in markets that allow us to more quickly adapt to our ever-shifting environment, even when we don’t know in advance what that environment will be. I hope you find the letters helpful. This letter will cover the philosophical underpinnings of my thinking. First, let me quickly review the investing challenges as I see them. First, there is the massive imbalance between the debts governments owe and the promises governments have made, sure to cause enormous market turmoil, the timing of which will be somewhat unpredictable. Second, there has been a common misperception of critical points that Harry Markowitz made in his 1952 graduate student paper that eventually became his 1990-Nobel prize-winning work that we now call Modern Portfolio Theory (MPT). We have followed an interpretation of MPT that in my opinion could cause great damage to the returns and retirement lives of investors. We need to update our thinking to incorporate what I think of as MPT 2.0. Premature optimization is a major portfolio problem. Third, we must understand that the underlying core investments in most portfolios are undergoing radical changes, which makes any backward-looking portfolio model essentially worthless. I can truly assert that the standard investment line that “past performance is not indicative of future results” has never been more true than it is today. Further, the way we determine relative value within an asset class (especially equities) is being short-circuited in a way that could seriously impair traditional active asset management. And yet we can’t retreat from the market. The only way we can grow our portfolios and income, other than by being involved in our own businesses, is by saving and investing our earnings. But as I’ll describe below, markets will be volatile at best and destructive at worst. So how do we stay in the market yet avoid negative outcomes? How do we use “MPT 2.0” to diversify among asset classes and smooth out long-term returns in our portfolios when, if I am right, all that diversification may simply diversify our losses? That is what I have been deeply wrestling with for the last four years. I can see this train coming, and I want to get on it, not be run over by it. I am afraid most people will be run over it before they eventually climb on board, but with their assets much reduced. They will suffer this fate because they believe the future will play out like the past. We need, instead, to restructure our portfolios to make sure we get as much of our wealth as we possibly can to the “other side” of the coming crisis, because afterward, I believe, we will see the greatest bull market of our lives. We just have to get there with our assets intact. Let me offer the usual caveat/warning: This is my personal opinion based on my own analysis. There is no guarantee that I’m right. We are talking about an unknowable future. Many knowledgeable investment professionals will strongly disagree with me. That said, you and I have to decide how we will approach that future. These are my thoughts, so let’s dive in. We are coming to a period I call the Great Reset. As it hits, we will have to deal, one way or another, with the largest twin bubbles in the history of the world: global debt, especially government debt, and the even larger bubble of government promises. We are talking about debt and unfunded promises to the tune of multiple hundreds of trillions of dollars – vastly larger than global GDP. We are also going to have to restructure our economies and in particular how we approach employment because of the massive technological transformation that is taking place. But let’s keep the focus for now on global debt and government promises. All that debt cannot be repaid under current arrangements, nor can those promises ultimately be kept. There is simply not enough money and not enough growth, and these bubbles are continuing to grow. At some point, we’re going to have to deal with these issues and restructure everything. Now, people have been saying that for years. Remember Ross Perot and his charts in the early 1990s? We’ve all heard the doom and gloom predictions of the demise of civilization that will be brought on by our social security and/or healthcare and/or pension problems. And yet, these are real problems we must face. Facing them won’t be the end of the world, but it will mean we must forge a different social contract and make changes to taxes and the economy. That said, the day of reckoning is not here yet. We have time to adjust and prepare. But I believe that within the next 5–10 years we have to confront the ending of the debt and government promises supercycle that has been developing since the late 1930s. This is a global problem, but it will be felt most acutely in the developed world and China. The developing and frontier markets will be radically affected as well, but mostly by fallout from the impacts on the developed world. There has been no instance in history when too much debt didn’t eventually have to be dealt with. The even more massive bubble of government promises will have to be dealt with, too. We need some realistic way to decide how to meet those promises, or at least the portion of them that can be met. For the record, what I mean by government promises are pensions and healthcare benefits in all their myriad varieties. Governments everywhere guaranteed these benefits assuming that taxes would cover their immediate costs and future politicians would figure out the rest. Now the time is rapidly approaching when those “future politicians” are the ones we elect in the here and now. Typically, after a significant recession there is a deleveraging of society. That’s certainly what many expected in 2009. Individuals in some countries did in fact reduce their debts, but not governments and corporations, or most individuals outside the US. Since that 2014 report was published, global debt rose by $17 trillion through 3Q 2016. In fact, in the first nine months of 2016 global debt rose $11 trillion! After averaging a little over $8 trillion from 2007 through 2014, global debt growth is now accelerating. Global debt-to-GDP is now 325%, though it varies sharply by region and country. Interest on the national debt is the third largest component of our annual Federal budget – after social programs and military spending. In the most recent fiscal year, we paid $240 billion in interest on the national debt. That was a relatively low cost, because the Fed has kept interest rates artificially low for years – as savers can attest. Now, with the Fed hiking rates, interest costs are set to soar. The Congressional Budget Office estimates that every percentage point hike in rates will cost $1.6 trillion over the next ten years! And that’s without adding to the debt itself every year, by running budget deficits. That 1% rate hike will take roughly an additional 3% of our current tax revenues every year. Governments must cover higher interest costs with additional taxes, lower spending, or an increase in the deficit (which means more total debt and even more interest rate cost). Of course, higher interest rates affect more than just government interest rates. Many of us have adjustable-rate mortgages and other loans with floating interest rates. It is not just the US that faces a serious debt problem. Global GDP is roughly $80 trillion. If interest rates were to rise just 1% on our global debt, an additional $2 trillion of that GDP would go to pay that debt increase, or about 1.5% of global GDP. 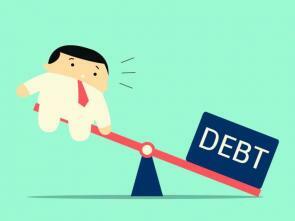 As we have discussed many times, debt is a limiting factor on future growth. Debt is future consumption brought forward. Repaying that debt requires either reduced future consumption or some kind of debt liquidation – those are the only choices. Debt has additional consequences. I have highlighted research from my friends Lacy Hunt and Van Hoisington that correlates increased total debt with slower overall growth. The graph below from Hoisington Investment Management shows total debt as a percentage of GDP for the major developed countries. Note that Japan, with by far the highest debt-to-GDP ratio, is growing slower than Europe, which is growing slower than the US. China’s debt is rapidly overtaking the US’s debt, and at its current growth rate it will soon overtake Europe’s. The grand Chinese debt experiment will eventually reveal the true linkage between the size of debt and growth. A Citibank report shows that the OECD countries face $78 trillion in unfunded pension liabilities. That is at least 50% more than their total GDP. Pension obligations are growing faster than GDP in most of those countries, if not all. Those are obligations on top of their total debt. By the way, most of those pension obligations are theoretically funded from future returns, which are going to be sparse to nonexistent. That means obligations are compounding significantly faster than the ability to pay them. Without serious adjustments to either benefits or funding, there is literally no hope of catching up. Thought exercise: In European countries where taxes are already more than 50% of GDP, where will they find an extra 5–10% to meet those future pension obligations? How long will younger generations tolerate carrying older generations when the government is taking two thirds of their paychecks? You can begin to see the scope of the problem. Sometime this year, world public and private debt plus unfunded pensions will surpass $300 trillion – not counting the $100 trillion in US government unfunded liabilities. Oops. These obligations simply cannot be paid. A time is coming when the market and voters will realize that these obligations cannot be met. Will voters decide to tax “the rich” more? Will they increase their VAT rates and further slow growth? Will they reduce benefits? No matter what they decide, hard choices will bring political turmoil, which will mean market turmoil. History shows it is more than likely that the US will have a recession in the next few years, although one doesn’t appear to be on the near horizon. But when it does come, it will likely blow the US government deficit up to $2 trillion a year. Obama took eight years to run up a $10 trillion debt after the 2008 recession. It might take just five years after the next recession to run up the next $10 trillion. Here is a chart my staff created in late 2016 using Congressional Budget Office data, showing what will happen in the next recession if revenues drop by the same percentage as they did in the last recession (without even counting likely higher expenditures this time). And you can add the $1.3 trillion deficit in this chart to the more than $500 billion in off-budget debt, plus higher interest rate expense as interest rates rise. Whether the catalyst is a European recession that spills over into the US, or one triggered by US monetary and fiscal mistakes, or a funding crisis in China, or an emerging-market meltdown, the next recession will be just as global as the last one. And there will be more build-up of debt and more political and economic chaos. President Trump is a fairly controversial figure, but I think most of us can agree that Trump is going to make volatility great again. The Great Reset will bring an increase in volatility, and the correlation among asset classes will once again approach 1.0, as it did during 2008–2009. If I’m right about the growing debt burden, the recovery from the next recession may be even slower than the last recovery has been – unless the recession is so deep that we have a complete reset of all asset valuations. I don’t believe politicians and central banks will allow that. They will print and try to hold on as long as possible, thwarting any normal recovery, until markets force their hands. But then, I can think of at least three or four ways that politicians and central bankers could react during the Great Reset, and each will bring a different type of volatility and effects on valuations. Flexibility will be critical to successful investing in the future. (Next week, in part two, we will deal with two other major problems in putting portfolios together, but today’s letter is long enough. I will wrap up with just a few comments). So let’s sum up. In my opinion, the entire world is entering what I call the Great Reset, a period of enormous and unpredictable volatility in all asset classes. I believe that diversifying among asset classes will simply diversify your losses during the next global recession. And yet, active management seemingly has not been the answer. So what do we do? I think the answer lies in diversifying among noncorrelated trading strategies that can invest in any asset class. For a reasonably sophisticated investment professional with sufficiently high assets, there are any number of ways to diversify trading strategies. Up to this point, I’ve talked philosophy rather than action. Now I will tell you how I intend to diversify trading strategies and give you a link to the actual strategies and managers I will be using. Some will not agree with the philosophy outlined above, some will think they can do a better job themselves. However – putting on my entrepreneurial business hat – my hope is that some of you will join me. Back in the day, I allocated money to asset managers who traded mutual funds and did so successfully. Unfortunately, the rules changed to make active trading of mutual funds difficult, which significantly reduced return streams. But the growth of money in exchange-traded funds (ETFs) changed things again. Globally, there is now about $4 trillion in ETFs. There are almost 2000 ETFs in the US alone, and according to ETFGI there are 4,874 ETFs globally, with assets skyrocketing from $807 billion in 2007 to $4 trillion today. * This is an abridged version of an article from Thoughts from the Frontline, John Mauldin's free weekly investment and economic newsletter. It first appeared here and is used by interest.co.nz with permission. What Maudlin fall short of is understanding what Aristotle essentially described. Investing is about trying to get free stuff, money for nothing, unearned income. So Mauldin's critical failure is not realising the free stuff is running out. Investing today has become a game of musical chairs. For both of you this is the first of TWO letters. So let's just wait and see what the other says? Besides he did predict that many would disagree with him. I guess history will be the final judge. LOL .. the great Reset. He explains why the Ponzi is about to come to a screaming halt, then somehow starts talking at ways to sensible invest in the Ponzi. Deluded. If you write off that debt, you write off all the promises and wealth. Thats one massive deflationary spiral. It will be 2008 squared. That free stuff such as "capital gains" are starting to evaporate in all the gate way cities including Auckland. It's not that capital gains are 'evaporating' so much as governments are artificially putting in place restrictions on the potential for growth. Without the restrictions the capacity for more growth is still there. Think about it. In the years ahead the prime properties will be inside the few 'Elysiums' and out of reach to all but the wealthy. Get in while you still can. Zachary there is no Elysiums! Even in the film adaptation it didn't work out well for the ruling Elite. Your paper castles capital gains are start to disintegrate we can all see it. Don't kid yourself it's you that is most at risk! Look at the latest Auckland auction results if you don't believe me, let the facts speak for themselves. The top end buyers are GONE Zach, flown the coop, gone bye bye! And now that the cat is out of the bag, exposing China's debt levels they're not going to be back for quite some years to come. It's not that capital gains are 'evaporating' so much as governments are artificially putting in place restrictions on the potential for growth. You mean like the Chinese govt stemming capital flight and preventing the outflow of ill-gotten gains. Is this what's stemming the "potential for growth"? That "growth" wouldn't happen to be inextricably linked to the same capital flight, would it? "governments are artificially putting in place restrictions on the potential for growth.."
You sir, then do not know what growth is... picture bacteria in a petri dish. "The average selling price in the Toronto area was C$890,284 ($658,000) through May, up 17 percent from a year earlier"
Yes agreed Yvil, property markets do not crash over night. That's what people don't seem to realize here. A property crashes can play out over a year to two years. As and example the UK 2008 crash played out over two years. It took eight years for their property market to recover. Too bad they've shot themselves in the foot with Brexit - the London market is on the decline now. The only way any of these problems will be addressed is via a massive recession and the current policy approaches are totally discredited once and for all. ETFs (and passive investment) are a huge part of the problem. I'm not sure how investing in the problem helps hedge against the problem. I'm less worried about index ETFs than the ETFs that are full of financial instruments that are heavily leveraged, and then leveraged with debt leaving little to no real assets in the ETF. I'm using a modified approach to MPT. It's the best I can do in the environment and that the next 3 years are looking very volatile. Are you saying that active investment is not a part of the problem? This may be the dumbest question ever. If the whole world owes all this money who or what do they have to repay it to, there must be one hell of a wealthy entity out there. Have the banks just printed the stuff and called it a loan, if so I would like my own bank. You can just buy shares in the banks. Same as if you want to win at the casino, the house always wins so buy shares in the casino. Great idea, then when it goes belly up I can take, sorry steal everyone's savings. Nice layman logic. Banks are part of a monetary construct that juices the social contract. You can argue that the laws of nature don't apply to artificial constructs so your layman law would seem to be a good option for most. Personally, I don't believe in the infallibility of the construct (the equivalent to your casino house), and when those leaks and fissures react, it can be like the butterfly flapping its wings in some foreign land that you're totally unaware of. I was pointing out that it is possible to become a part owner in banks. Whether or not it's a good idea, or an ethically acceptable idea is a personal decision. Back onto your subject you're right a bank or a casino can go bust and your investment can disappear. Who knows what will trigger the event. The triggering even may already have happened and there's some latency before panic sets in. Well you did say "the house always wins." Ownership of bank stocks is already as primed as any time in history. And that, to me, is the inherent risk. Whether or not the bank goes under or you lose the investment is beside the point. There's an element of irony to what I've been posting. Something that doesn't translate well without emoticons, etc. Banks are very heavily leveraged and have so little capital a minor bank run would create problems. NZ banks have $2.26 in capital for every $100 they lend out. Stephen Hulme has pointed out that ANZ has a mind blowing position in derivatives. Lots of leverage gives massive returns but it's a financial time bomb. I view the big four banks as extremely risky assets, riskier than a number of our smaller banks. OK. Most Australians are owners of the Big 4 banks (through their super), which are explicitly and implicitly guaranteed by the govt and the taxpayer. If they are indeed money trees and a pure expression of the wonders of global monetarism, it's a good thing. Mind you, if I were an Australian citizen, there would a good argument for the banking sector to be nationalized considering the taxpayer is on the hook. They still have that considerable bank deposit protection. The Australian politicians can barely get a budget together, I wonder how they'll deal with a bail out? The simple answer is the Future is the wealthy entity (because hes the guy that underwrites all the promises). As long as the future is bigger and brighter than now there is no problem...! Cant see any flaw there can you? Thank you, I could never wrap my head around that. It seems to go against everything your mother told you about saving up for things you wanted. I think this debt will never be repaid so the future looks pretty bleak to me. Growth cannot continually go up, there are only so many smartphones people can buy. If all the people from war zones and the third world stayed where they were and we grew those areas then maybe there is hope. The western world and financial system will collapse under the weight of supporting these extra people. When politicians realize we are on the brink of a major recession and they may loose their positions they will engineer a massive conflict in the world somewhere to save their bacon and to take up the slack in their economies. We have seen it so many times before, why is this time different? Very good question, who are the creditors who are owed these exponentially increasing trillions of debt. This is why everyone is buying Bitcoin. There should be seminars on how to set up wallets though, if I knew how to do this when I first started looking at it late last year I would be rich now. I realise that, that is why I would like to get some advice on how to secure it properly. I don't think getting advice, assistance and trying to educate yourself is being stupid. .. imagine the pain of the poor bugger in Yorkshire who accidently cast his lap-top into the local rubbish dump ..
.. and he's lost the lot ... OUCH !!! USB. Secured . Use PGP. And check your trouser pockets before putting them in the wash.
Banquet is over, who is going to pay? He missed the only asset class's that will be left after the reset - Crypto and Gold. and I wouldn't touch a ETF with a barge pole. If you are talking total collapse there will still be currency in circulation. The value of that currency may vary greatly in that event. The E in EFT means Electronic; you can't touch digital currency with anything physical like a barge pole! Hangon, debt may be 'future consumption brought forward.' But at a macro level does it really matter? For every $ of debt there is someone who has saved and lent/invested that $. And savings as we all know is 'current consumption delayed'. This whole article sounds like a dodgy investment infomercial. Nope, 3 words, fractional reserve banking. As per my comment above I would edit your comment to say; "For every $1 of debt there is someone who has saved and lent/invested $0.0226." It's worse in Australia where it's less than 2c. So everyone giving their two cents is more than what's in the Australian banking system. Great article John Mauldin, can't wait for part 2. You have also explained more aptly and more eloquently than I could, why I believe and keep posting that interest rates will not rise significantly. I am not an economist but I do understand the points John Mauldin is making. It would seem that loans have been made in at least three categories. 1/ Government to Government. 2/ Private institution (such as a Japanese retirement fund) to a government or other private institution and 3/ Financial institution (such as bank or Insurance company) to a government or private institution. On the surface the best solution is a mutual forgiveness of debt say between the Japanese government and the American government. The devil is in the detail though because many of these loans are convoluted so resolving it to all parties satisfaction would be hard / impossible. Perhaps the most exposed are the Financial institutions as they have created "virtual" wealth by effectively permitting multiple loans against the same deposit fueling the rapid rise in available credit. Perhaps in the great reset the winners will be those who can default without penalty and the losers will be those who get defaulted on. You are right IMHO. The only Q will be will the defaulted on accept that? Marx would be turning in his grave, capitalism is supposed to choke on capital,not debt. There may be a Leninist/Stalinist solution to it all. You started off very well, laying out how I see things ie " when, if I am right, all that diversification may simply diversify our losses? " until you concluded there would be a massive bull market afterwards. You are day dreaming at that point, IMHO. What you are failing to see is the cause of the present mess will never reverse at least ever to the point it can sustain anything like the numbers of financial parasites such as yourself we see today. Kunstler and Mark Blythe commented very well on the financial parasites future.